Visa, a FIFA partner and the exclusive card of the 2010 FIFA World Cup™, has created a Go Fans YouTube channel enabling soccer fans to express their true colors in support of their national teams by viewing, uploading and sharing videos capturing creative, entertaining, passionate or humorous goal calls. By watching goal call videos on the Go Fans YouTube channel that are part of the Visa Watch your Way to Brazil Sweepstakes, fans will also have the opportunity to win a trip to the 2014 FIFA World Cup™ in Brazil. From June 1 through July 11, fans can visit www.youtube.com/visagofans to upload and view videos sorting by most popular, by country or by friend. 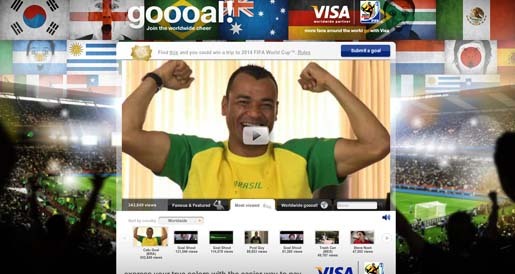 Viewers will receive an opportunity to enter the Visa Watch your Way to Brazil Sweepstakes each time they find a goal call video with a golden tint treatment. In addition to the grand prize trip to the 2014 FIFA World Cup™, fans will have the chance to win weekly prizes including $100 Visa gift cards. No purchase or obligation necessary to enter or win. Official rules are available at www.youtube.com/visagofans. Leading up to and during the 2010 FIFA World Cup™, celebrities including Steve Nash (NBA star, Canada), Cafú (former soccer player, Brazil), Jorge Campos (former soccer player, Mexico), Andres Cantor (sportscaster, Argentina), and Tulio (soccer player, Japan), will show their passion and encourage other fans to do the same by filming and submitting their best Goooal videos to the Go Fans YouTube channel. Made famous by Argentinean sportscaster Andrés Cantor, best known for the length of his goal shout, the call of “Goooal!” has become a popular shout passionately emoted by fans and sportscasters alike during a soccer match. Cantor himself will provide a brief online tutorial on perfecting the art of the Goooal shout, along with his own Goooal video, to help fans perfect their impassioned goal cries. The Goooal shout will also be brought to life through a series of activities and events around the world set to take place between May 15 and June 19 in participating markets including the United States, Australia, Japan, Mexico and Brazil. In the United States, Visa Go Fans street teams will visit popular New York City restaurants and bars from June 12-19 to record Goooal shout submissions from fans viewing FIFA World Cup™ matches. Select videos will later be uploaded to the Go Fans YouTube channel. Also in New York City, creative from the Visa Go Fans FIFA-themed marketing campaign will be featured on four of Times Square’s largest digital billboards, ABC’s SuperSign, American Eagle, NASDAQ and Reuters, during 11 broadcasted 2010 FIFA World Cup™ matches beginning with the USA vs. England match on June 12 and concluding with the final match of the tournament on July 12. The Go Fans YouTube channel and the Visa Watch your Way to Brazil Sweepstakes represent the latest extensions of Visa’s first-ever global FIFA-themed marketing campaign which also includes print, television and out-of-home advertising, host market merchant activation programs, usage promotions and social media extensions. Visa recently released the Visa Match Planner application that allows users to create customizable, dynamic FIFA World Cup™ viewing schedules to share with friends via social networking channels such as Facebook. First debuted in Latin America in 2009 and later introduced globally in February 2010, the Go Fans campaign celebrates the common love that all fans have for soccer with creative executions, featuring the colors of the national flags of each of the 32 qualified countries, symbolizing the expression of each fan’s true colors and love of country. The campaign reinforces the ways that Visa enables fans to express their true colors in support of their teams by offering an easier way to pay, their Visa card. Go Fans was developed to connect with soccer fans worldwide to drive preference for and usage of Visa products, promote Visa’s association with the 2010 FIFA World Cup South Africa™ and reinforce the ways in which Visa enhances the fan’s FIFA World Cup™ experience. Today, more than 90 markets throughout the world are activating Visa FIFA-themed marketing programs with more than 500 financial institutions and merchants via advertising, customized promotions and the development of marketing collateral (POS, signage and direct mail).